English Cocker Spaniel. "Yes! Lets Do It Now Says The Happiest Dog In The World". Welcome To The English Cocker Spaniel! History Of The English Cocker Spaniel: One of the oldest dogs in history, is the Spaniel, the dog which the English Cocker Spaniel descended from. This dog hailed in stories written by the greatest authors of all time such as Chaucer and Shakespeare, you will even fin that the Spaniel was around in England when Caesar invaded. The English Cocker Spaniel's ancestors were in many famous places throughout history. The English Cocker Spaniel belongs to the gundog group. There are two varieties of English Cocker Spaniels, The "working" cocker and "show" cocker. It is one of several varieties of spaniel bred worldwide. Due to the breed's cheerful temperament and endlessly wagging tail, it is often referred to as the "merry cocker". Many people disagree about where the dog came from, some people assume that the Spaniel must have come from Spain and the word spaniel is a variation of the word Spanish. 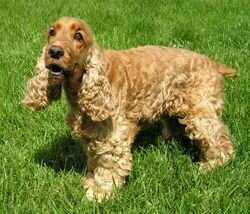 However it is believed that the two types of spaniels came from England. One type was bred to retrieve water fowl after they were shot down, the other type were trained for land hunting. These two were further divided into springing spaniels and setting spaniels. The setting spaniels pointed out their prey and allowed their master to get the game in their nets. 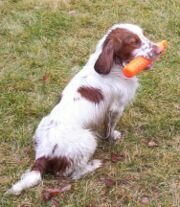 Springing Spaniels were the ones who sprang pheasants, partridges and rabbits for hunting with other animals. The next generation of spaniels would come from the Springing spaniels, the ones that were large were springer spaniels, the mid sized puppies would be sussex spaniels and the smaller dogs would become cocker spaniels. In the 1800s, cocker spaniels had a problem being recognized as such in the beginning of their recognition as a breed. 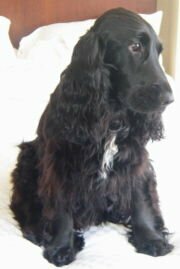 The reason for the problem is that one year a puppy may be classified as a cocker spaniel, only to be listed as a springer the very next year as they got bigger. In 1879, they began breeding what would later become the English Cocker Spaniel. The English spaniel came about By breeding the Sussex spaniel father and the field Spaniel mother, the Obo was then created and would become the English version. The American version of the spaniel was smaller, more beautiful and more for show than the English version, which was meant for hunting. During this time, another development occurred in the breeding of the cocker spaniel, where breeders would dock the tail of their dog in order to keep the dog from hurting himself while in the brush when he was flushing out the prey. Today this is not something that is done usually and if it is, there is anesthesia as not to cause the animal distress. There are many risks to this procedure that may be considered when deciding on the procedure. In the 1900s, the cocker spaniel became one of the more popular animals and made its way into the show dog arena. People were big fans of this dog because of its lovable disposition. However this caused an explosion of dogs who were now inferior in quality, they were now plagued with all sorts of hereditary problems. Nowadays, the lovable English cocker spaniel is more of a pet than a show dog, and they are very lovable and great for children. They have a long history of faithful companionship which has not changed since the very beginning of their being. The English Cocker Spaniel is a tough, compact, well-balanced dog. It bears a characteristic expression demonstrating intelligence and alertness. They are extremely friendly, always playful, completely faithful, quiet, and well natured dogs. They pocess a wonderful temperament and are first-class family pets. They will often times bond to one person in a family more than other members of the family group. English Cocker Spaniels are extremely intelligent dogs who are really easy to train. Obedience Training is a must for cocker spaniel. They love to please their owner, and are always very eager to learn new skills. They are ideal family pets, and tend to get on very well with children and any other household animals you may have.